Luis Maravilla (Luis Lopez Tejera) was a Flamenco composer. He was born in Seville, Spain. 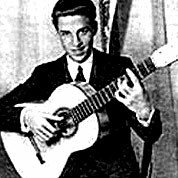 Maravilla studied guitar under Marcelo Molina and Pepe de Badajoz, and debuted professionally at the age of 12 in the Pavon Theatre of Seville. In the 1930’s he toured much of North and South America.